Strong buyout returns have investors putting more money than ever into funds that acquire companies with loads of debt. But deal multiples are nearing record highs, too. As legacy LBOs like Toys R Us and Claire’s go bust, it’s a reminder of the industry’s tendency to overheat. 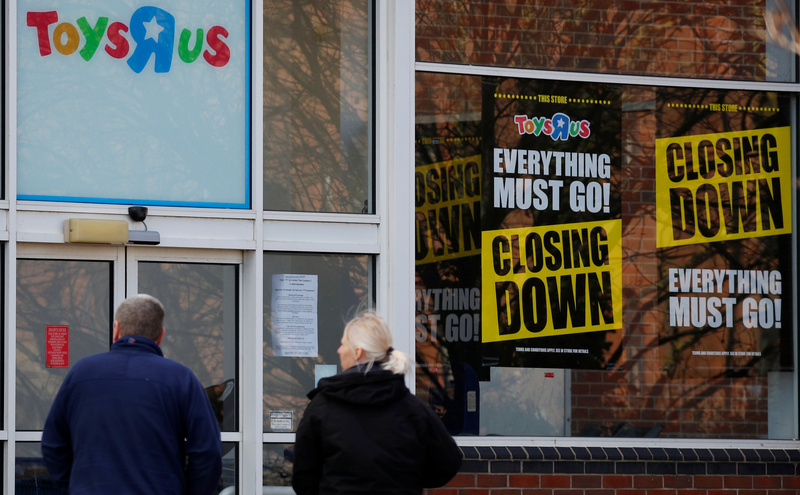 Closing down signs are seen outside the Toys R Us store in Liverpool, Britain, March 19, 2018. Claire's Stores filed for Chapter 11 bankruptcy protection, the U.S. jewelry chain said on March 19. The company is owned by Apollo Global Management, which bought it in 2007 for $3.1 billion. The largest U.S. radio company, iHeartMedia, filed for bankruptcy protection on March 14 while agreeing with creditors to cut its debt by more than half. It was bought in 2008 by Bain Capital and Thomas H. Lee Partners. On March 15, Toys R Us asked a U.S. bankruptcy court for approval to stop paying vendors while it tries to find buyers for its international businesses ahead of a planned liquidation of its U.S. operations. The company filed for liquidation authority on March 14.